Big big thanks to the Adur club, with Gavin and Steve looking after us in the best possible way this weekend. Although weather was a bit iffy, it brought out the concentration and skill needed, for most drivers anyway! Personally, nitro wise, I had great fun, the mostly dry track on Saturday was great to test on and the full wet conditions on Sunday was quite enjoyable. And quite happy that all the nitros got through qualifying with no water problems (apart from wet air filters!). Unfortunate for Karl, who was really on the pace, to have a non water related glitch putting him out of the last final. Congrats to Neal Vater in Superbike, Alex Wynn in stock and Martin in sidecar. And just wanted to say that all the hard work, preparation, stress (and distress!) Put into this National series, is much appreciated. Alan Leighton. Well what can I say about Adur, I'd never made the trek down before, so was very upbeat having arrived late on Saturday and only managed a quick run round on a damp track but first impressions were good, I loved the track and the location, my freshly rebuilt engine was running fine and all was good in the world! Unfortunately Sunday was not the dry day we hoped for and one thing after another meant my racing did not go my way either, I still haven't got to the bottom of my radio problems but think I have a couple of servos that are failing rather than any water related issues. The wet track was very much a leveler and running in the rain was very tricky but so rewarding when you got it right, it was great to see so many braving the conditions and looking great in the photos that have been posted, some of the close ups John managed to get look fab! Special mention has to go to Alex, who had massive problems with the rain and electrics but kept working hard to fix the esc issues he had and all this hard work paid off with his first win! Well done that man! What was that special ratio of rain water to WD-40 in that bag again? It was great to see everyone and catch up after what seems an age without any racing! Thanks to everyone that kept positive and made the meeting great and those that put in the hard working behind the scenes too. 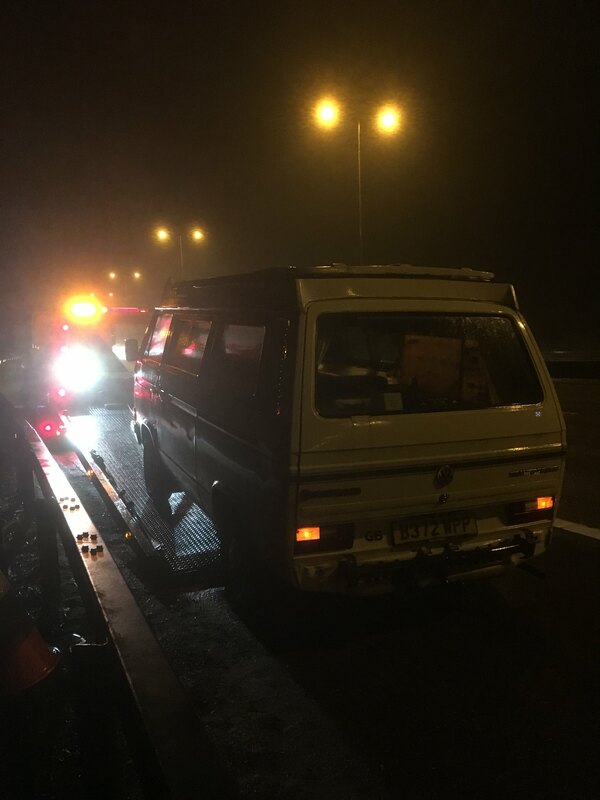 So normally the story would end but having packed up and headed off I hit the M25, all was fine for the best part of 20mins before I broke down, I soon found out that the M25 is not a nice place to sit waiting to be rescued but cutting a long story short I got home at around 4am with the van running again but rather fatigued to say the least! I hope you all made it home safe and sound??? Roll on Cotswolds and some sunshine please! Drives:- T3 Camper, T3 Doka, Touareg, Golf and Beetle Cab. What a report only sorry you didn't get the running you deserved. 4am finish and then work, that is commitment. Let's hope Cotswold is totally without incident and you can have another great weekend. That's a sad picture Karl. Sorry to hear you had a nightmare journey. She does have a habit of breaking down at the worst time though (Rotterdam on the ferry?!!). Ken and I stopped off Sunday night at a travelodge, but Monday morning traffic on the M25 in the rain - utter misery I wonder if there is ever a good time to be on that stretch of hell. Yes, you took to the track straight away, almost like you'd been before and the bike was looking and sounding sweet. Shame about the glitch, it could have been close in the final..
What happened to your van, water get in your real electrics too? Yup. We found out mornings ain't good. But 3am? I would have lost my licence for sure, if breathalysed! Yes John I was gutted how my weekend went and breaking down is one thing but when I can't fix it that's so frustrating. Ah I remember the incident on the ferry but that was just a simple fix compared to this one Lol! Alex, it was a little black box that failed, the amplifier for the electronic ignition, the worst thing about it was that at stupid o'clock when the AA bloke finally arrived he help me diagnose the problem and immediately said, 'I'm not going to have one of those on the van, so I'll book the low-loader' so there was me looking forward to a snooze on the way home. But low and behold he emerged from his van with a small cardboard box with a new amplifier inside! What are the chances! I'm really looking forward to the Cotswold's, hope we all have some close racing, but do I trust the van to get me there??? Well that must be the nicest weather I have ever experienced at a bike national. The Cotswold track is certainly a top bike track and it was great to see a lot of excellent driving here. Great track / racing / people / weather. What more do you need in life! Personally I struggled a little with the nitro bike all weekend, so was more than happy to take a 1st and 2nd and had a fun race long tussle with Karl Boak who got the equal but opposite result. And Congrats to Peter Vater for the overall moto2 win. Big thanks to the Cotswold club and our series sponsor MotoGB. You did well with that old bike Martin. I can't imagine what you'd be like with a new RG! Yes, Halifax is going to be ace, I can't wait.